We all know how much I love clothes- if there was an alternative name to this blog it might be "I Love Clothes"! Not just any clothes but clothing made to last with intention and integrity- items that stand the test of time, fads and trends- so no fast fashion here friends. Much of my closet consists of handmade items or things that I have saved up for and then proceeded to wear for many many years- I would rather spend my time in the garden that in the mall. Since moving back to the Okanagan however my closet has felt a little flat- I just do not wear half of what I did in the city. Much of my city wardrobe looks like I stole it from Tia Russel ala the petulant niece in Uncle Buck- if you are under 20 and reading this reference *might* be retro enough to make sense. At any rate I have been feeling a lack of direction in my day to day accoutrement and so when the seasonal 10 x 10 Style Challenge popped up I thought this might be just the ticket! What is the 10 x 10 challenge you may ask- consider your entire closet- including shoes and outer wear- now pick 10 things and wear them for 10 days. First of all you will literally be the only one who even notices- no one else cares what you are wearing. Second of all you will carefully consider your level of entitlement- that a capsule wardrobe is even in your wheelhouse. You just used the word wheelhouse. 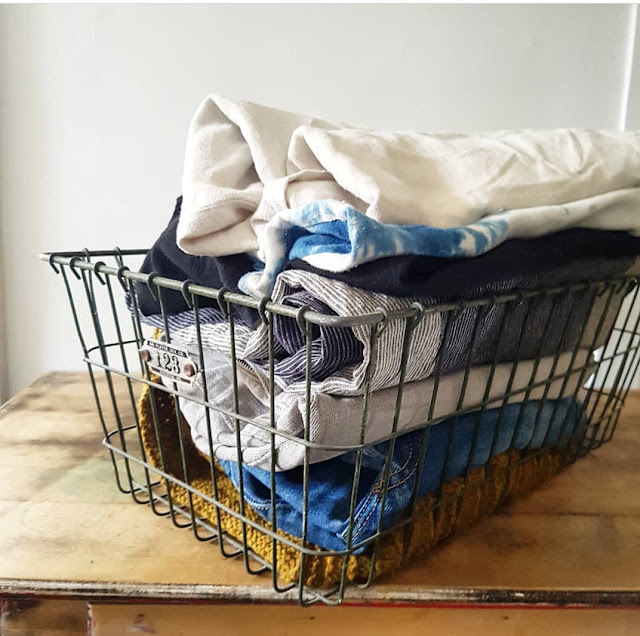 Creating a capsule wardrobe is an incredibly entitled exercise in living- the fact that you (and I mean me) even have time to worry about your clothes means you have less pressing things to worry about- like feeding your kids. Clearly capsule wardrobes are for bored housewives- but they aren't- not really. So after carefully examining my status in society and use of second person prefix I now explain. Right now when I look in my closet it is filled with a few favourite pieces of clothing and guilt- a lot of guilt. That guilt looks a lot like clothes I own and never wear- and when I imagine future Sharilyn she isn't wearing any of those clothes. My idea is that after going for 10 days wearing my favourite most comfortable items of clothing I will be able to let some things go. This might be the same thing I do to my kid's school projects- hide them in the closet for a week and if no one notices throw them out. While I won't be throwing away perfectly good clothing I will most likely pass a few things on to friends I know will love them- I will likely cut some things down into Spring outfits for my daughter- and I might dip my toe into consigning at a local store. I will not send these textiles out into the great void of second hand clothing- I will recyle responsibly. What made the cut you might be asking? Well obviously my new Veronika Cardigan that I just finished knitting and wear all the time- this is SO me! My old standby Eileen Fisher jeans- I love this company- did you know E.F. has a sister site that sells gently used E.F. goods? Love it! I have a self drafted peplum top I sewed last fall and lived in all winter and my trusty Elizabeth Suzann- Harper tunic- I wear this probably twice a week already. Plus of coarse my Rains rain jacket- Hunter boots and white Converse sneakers- yeah I'm a bit basic! If you made it this far and are still reading yipppeee! You can follow along with the fun over on good old Instagram. If you want all the deets and to possibly consider your own 10 x 10 Style Challenge you can check out the brains behind the movement over on Style Bee. So ultimately as much fun as I am poking at the idea of a capsule or minimalist wardrobe I really admire people who live with less- I aspire to live with less- and to do so stylishly. What I hope to get out of the next ten days is some freedom from that guilt hanging in my closet- I think it's time to let go- I'm ready! 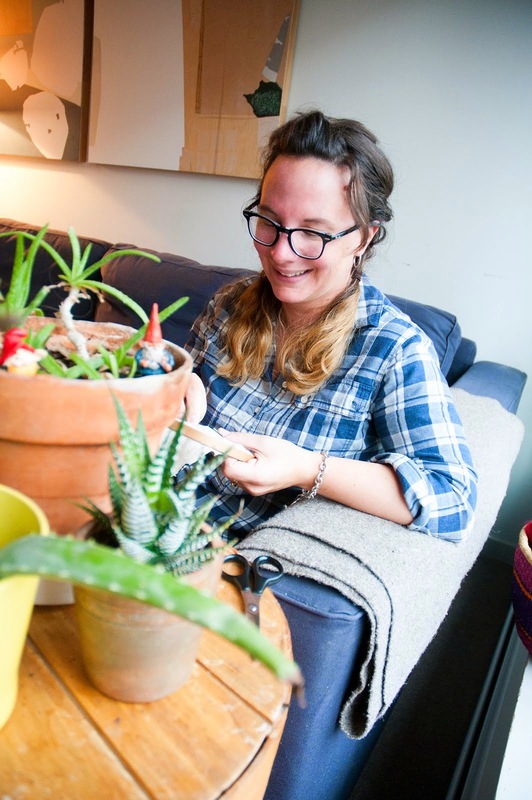 I think these days there are just so many amazing publications and opportunities for makers and shakers that there is a very real fear of missing out (F.O.M.O.). It's a thing- it's symptoms are very similar to anxiety and often leave the maker in question with a nagging sensation in the pit of the stomach that there are simply not enough hours in the day! Over the past few years I have come to acknowledge this feeling- I hold onto it for a day or so- say hello- how do you do- and then let it move on down the road. I simply cannot knit or sew all of the things I would love to. Playing a huge role in this craft anxiety is the fact that there really are just so many amazing things happening in the world of making. The pressure to create whats trending on social media or other platforms can be massive- especially for someone with a short attention span such as myself. I mentioned I have slowed it down- like way down. So much so that I am still working my way through publications from last Summer. Case in point is my much loved Issue No.3 of Making Magazine. I love this issue so much that I have knit 2 sweaters from it- baked the blue berry cake recipe many times over (once with cherries- amaze) and started a number of French knot projects. Up next is a little Spring skirt for my girlie. I love this issue just so darn much! 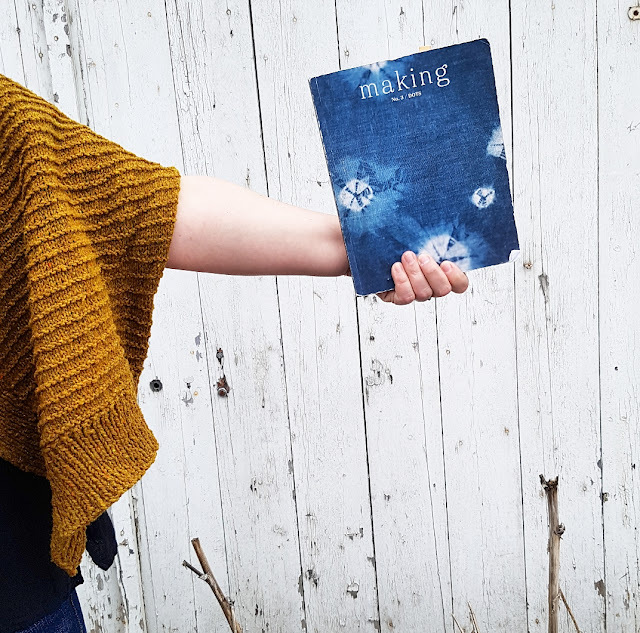 What Making does just so well is produce each issue as a stand alone book- I don't feel like I am missing out by continuing to use this issue as a resource. Each project is just so thoughtfully laid out and works so well together as a collection of beautiful handmade items and stories. And good news those beautiful words can be listened to regularly as my favourite magazine has collaborated with my favourite Podcasters to create the perfect holistic making experience! So this season I highly recommend saying a hard NO to fear of missing out also known as crafters anxiety and dig deeper into what you really love. Find the thing that inspires you and really experience it in it's entirety! Friends it is Friday- it's been awhile since I have written those words- and I am looking forward to far too much fun with friends- some good yarn and even better coffee! Happy Friday! P.S. I am in no way wishing to make light of anxiety- I know it's not a laughing matter. However there is a grain of truth here and that is we all need to know our limits. We need to start saying no so we can shed some of that fear of missing out and be present with what we love! I'm so happy the sun is out- the snow is receding and longer days spent outdoors are surely just around the corner. Of course I have now jinxed everything! I recently cast off this fun knit after working on it intermittently all winter- Christmas and Birthday knitting took precedent and this lovely was put on the back burner. But just in time for Spring I have the perfect cardigan- the Veronika! Knit from Brooklyn Tweed Shelter in Haystack is the Veronika Cardigan- pattern by Very Shannon. I simply love this pattern so much- a fun and easy knit- worked in a single piece and seamed at the end this is a pattern for all abilities! Described as cozy, rustic and effortless this cardi could actually be put in the shawl category but for the simple slit arm openings. This is seriously the most comfortable cardigan I have worn in a long time! The pattern was designed with Veronika Jobe of YOTH Yarns in mind- originally the yarn suggested was Daughter. However after seeing this knit up in Brooklyn Tweed I took the plunge and bought myself a sweater's worth of yarn on sunny fall afternoon. What I love about Shelter is it's so light and lofty while still retaining it's shape- it wears nicely under my rain jacket (which is roomy) and still looks good after. While I still need to block my Veronika I think I will be hard pressed to actually take it off long enough to do so! I am a monogamous knitter for the most part however as I near the end of one project my mind often wanders onto the next. Currently I am coveting two basic knits- with only the resources and time to knit one of them! 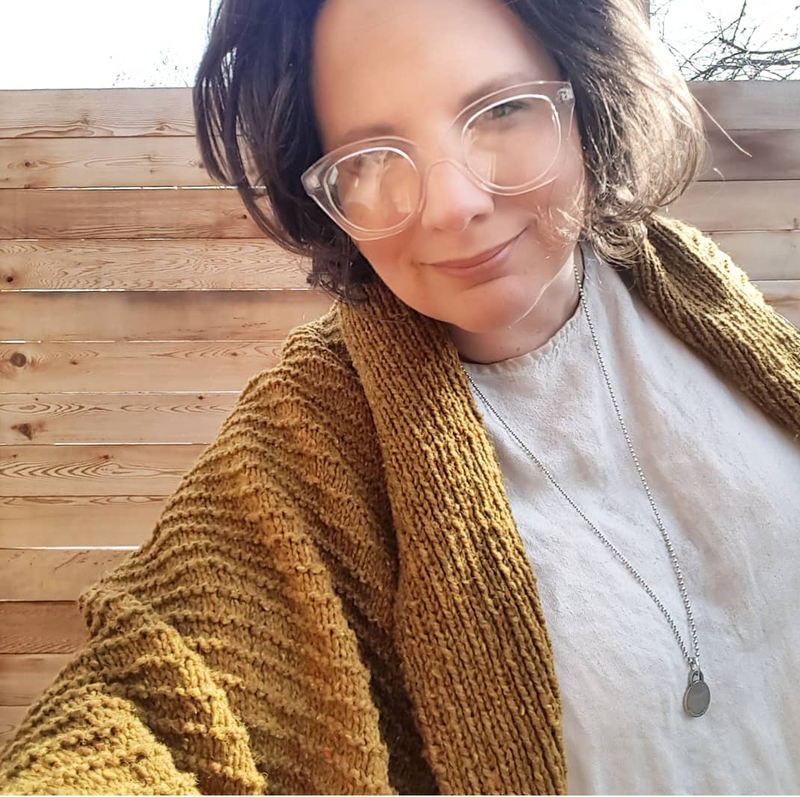 Both sweaters would make excellent wardrobe staples and fill some holes- I am really trying to be present and intentional with my making- knitting or sewing only what I actually need or really really want! 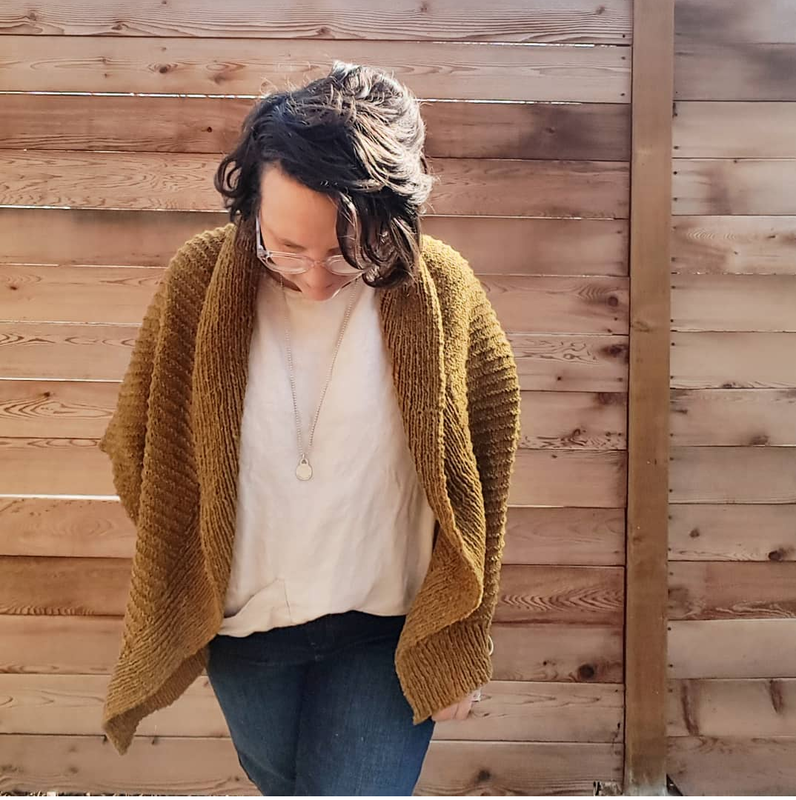 Above is the No Frills Sweater from the Petite Knit. This gorgeous wardrobe basic has been missing from my closet ever since I literally wore my Banana Republic crew neck to bits. Considering I no longer shop at Banana Republic or even have one in my town I think this would be the perfect sweater to knit with an eye towards next fall- so maybe a good summer knit? Below is the sweater I can hear angels singing over- when Brooklyn Tweed launched its Winter 2018 collection I almost died- which I generally do when B.T. comes out with a new collection- I love everything they do! So when the Freja cardigan popped up I just knew this one was meant for me- clean simple lines with a cool waffle knit detail. I love everything about it. I see it in Indigo blue. Hello Dear Friends- it's been awhile- a long long 2 year while! I really have no excuse other than to say life just carried me away. Having gone from writing here almost daily for so many years to not writing at all felt so strange- in my head I often catch myself writing content- it's a funny habit to shake. To say I have missed it is an understatement- I have truly missed expressing myself here in words and images. I feel like I am just in a different space now than when I was writing Weekdays From Scratch- is it still me? It is most definitely not about my kid's any more- those sweet days of having Littles is gone- these days they are rather big and guard their privacy fiercely. Will I still be current if I am no longer a cute Mommy blogger? Does this space still match who I am? These are all things I have been throwing around lately. To be honest I was trying to come up with another blog name- something more about knitting and sewing. More about my current interests- less about making crafts and taking adventures with my kids and something more just for me. That is where I am right now in my life- thinking about myself and what excites me! My weekdays are still mostly from scratch- in fact now more so than ever. With my Kiddos in school full time my days are most filled with making and doing. I still cook so much from scratch as it's something I'm passionate about- slow food- my actual garden! I still sew- again slow fashion is one of my biggest passions! And I am knitting more now than ever before. So maybe just maybe Weekdays From Scratch is still totally relevant? Maybe I don't need to change too much at all my friends- just maybe if it isn't broken I shouldn't try to fix it! So we will give it a try- I am going to start writing here again- maybe not so regularly but often enough. Talking about our new life- about everything I am loving about being home in the Okanagan. Showing up here is a bit like coming home too! A big shout out to both my friend Tannis who still reads what I have to say- you never stop encouraging me! 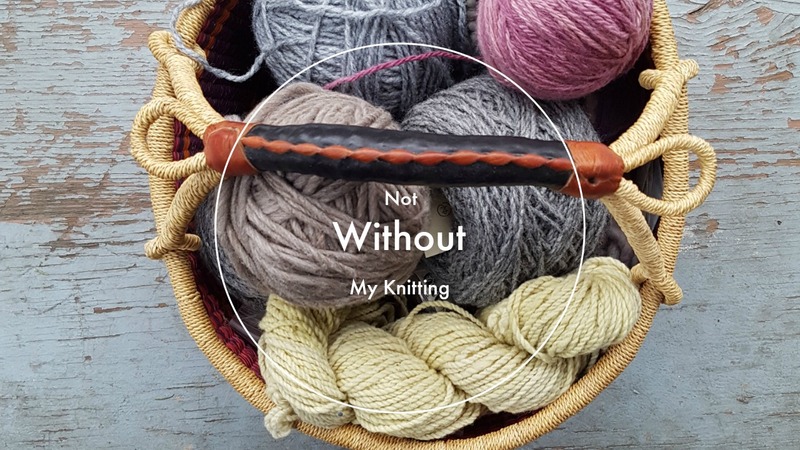 And thank you to Francesca who suggested the best blog name Not Without My Knitting- unfortunately it is taken but I loved your suggestion- so in tribute to that here is the header I would have used!